No matter where you are in your brewing adventures, we all have experience brewing in the kitchen. 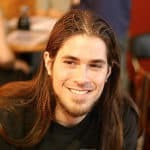 It is a great place to start, but at some point, you’ll have to give everyone a break. They are sick of getting their feet wet and having the house smell like bitter hops. But what other options do you have? Whether you are thinking about upgrading to an all-grain system or want to stick with a more simple set up, utilization of a propane burner brewing stand is a smart decision. Gas range stove tops are decent, but they aren’t able to push the amount of heat required to properly execute an all-grain setup. Electric ranges don’t get hot enough and take longer to transfer heat to your boil and wort. Brew stands are the best way to get your water to a boil fast and efficiently. They are designed to push out a lot of heat while supporting the weight of your brew. 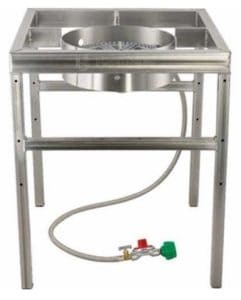 There are many different homebrew stands and burners that are available to both the beginner and expert brewer. 9 The Best Beer Brewing Stand? Want to move outside but don’t want to invest in a whole new kitchen? Yeah, me too. That is why the Bayou Classic SP10 High-Pressure Outdoor Gas Cooker is perfect. It is affordable, small, gets kettles to the right temperature, and holds a strong boil making it a very versatile brew stand. This high-pressure cooker is an affordable alternative to the patio cart. It doesn’t take up much room, and it is easy to store. It is also designed with a wide base for a sturdy foundation and has a low center of gravity. This high-pressure cooker is very easy to use. There are no complicated components, and it connects directly to your fuel line. Open the gas, light the flame, and you are ready to go. And unless a semi-truck runs over it, you should be able to use this burner stand for a lifetime. 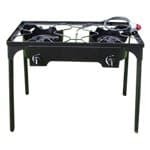 The portable dual propane burner stand with 30-inch Patio Cart by King Kooker is a two-tier system with two burners. The lower burner can deliver up to 60,000 BTUs while the top burner can put out up to a whopping 105,000 BTUs. The high rate of energy this system puts out drastically reduces the time it takes your water to boil. This will save you a ton of time, and you won’t have an issue keeping 10 gallons or more at a rolling boil. The only problem with this is it can empty your tank quickly. So take advantage of the flame valve controls. 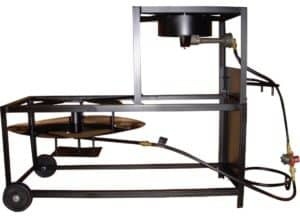 Both of the burners on this stand connect directly to a propane tank and have brass needle valves for individual flame control. The tiered system is also advantageous as you won’t have to move your kettles to use a siphon. 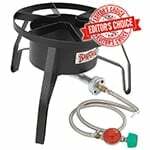 Very similar to the Bayou Classic SP10 High-Pressure Outdoor Gas Cooker is the Bayou Classic KAB4 High Pressure Banjo Cooker. The only real difference here is the frame. The weight of the cast iron makes it very stable and durable. 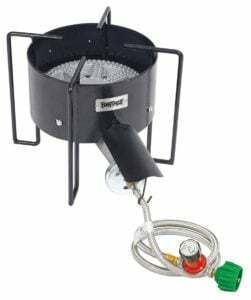 You won’t have any issues getting this burner going as it is easy to use and connects to your propane tank the same way your grill does. But don’t let its size fool you. This little guy has a mighty flame that produces up to 210,000 BTUs and can easily sustain a boil in a 30-gallon pot. 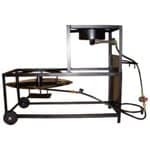 It comes with a 48-inch hose and PSI regulator making it a very versatile burner stand. 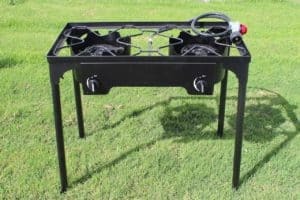 This double propane burner stand is made for the outdoors. There is no worry about weathering and rust with this guy. It is constructed of cast iron and will stand up to just about anything. 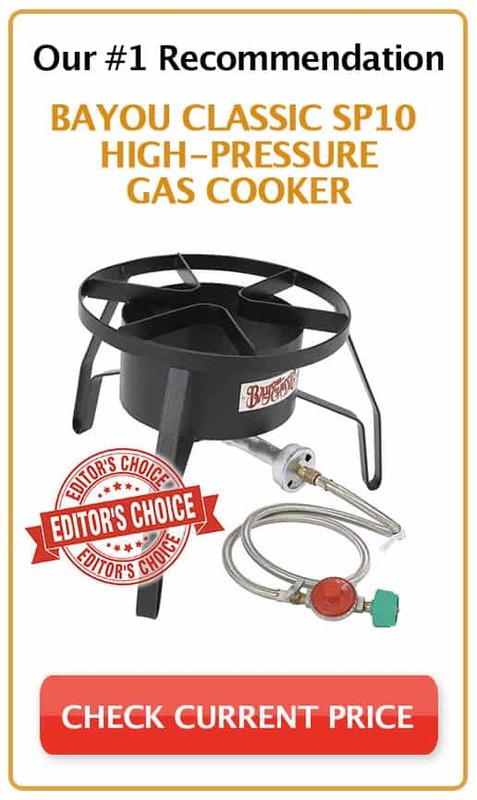 Capable of supporting two 60-quart kettles, each burner has a separate heat control and comes with a high-pressure regulator, hose, and connector. And don’t worry, the cast iron won’t make it a permanent deck piece. This stand has detachable legs so it can be easily moved and stored. The affordable nature of this unit puts it over the top as one of the best options for an outdoor brewing stand. Brewers at any stage can appreciate the work of this beer brewing stand. 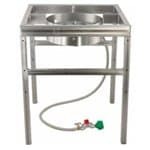 It efficiently serves the needs of any home brewing project and can be wheeled away when not in use. The wide base supports large pots and heavy items. The burner can put out up to 100,000 BTUs using propane fuel. So whatever you are looking to do with this stand, you can easily execute. Probably the coolest thing about this stand is that you can attach several of them together to create a brewing stand superset. They are also designed to be stackable for easy storage. BrewBuilt’s beer brewing stands are perfect for anyone currently brewing extracts and can it can easily support an all-grain system if you decide to upgrade later down the road. The Blichmann Top Tier Brew Stand is designed to be a brew stand which can hold your kettles and burners. With a 3 tiered design, you can easily set up multiple burners and take advantage of gravity for grain brewing. It’s one of the most universal brewing stand on the market. You can add or remove different burners, kettles, mash tuns and many more, and you can adjust it depending on how you want them to be positioned. Read our review here. Brew stands are a great option for frequent outdoor brewing. They tend to be taller and can support wider pots than cookers can. Despite their size, they are easy to stow away and move when you need some extra space. 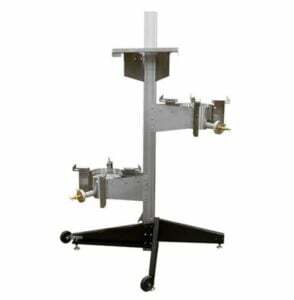 These home brew stands usually come with two burners or are easily upgraded to two or more burners. However, they tend to be more expensive than the cookers. While some are more affordable than others, there are none that are going to break the bank. In the end, picking the right beer brewing stand is all about personal preference. We recommend that you choose one that best fits your needs. The Best Beer Brewing Stand? I have enjoyed using the Bayou Classic SP10 which is my go-to brew stand when brewing outdoors. Now, I get what you’re thinking. It’s only 13” high! Is it even considered a brew stand!? For me, I don’t need to have my brew burner that high. When you factor in the brew kettle, it gives me the perfect height for workability when brewing. The wide-set legs allows for stability on a variety of surfaces. It feels solid, has good amount of heat output and is simple to control. It has a wide frame to support my brew kettles, and I don’t have to worry about it tipping over. I also love the heat output. It helps me to keep my temperature up when it is cold or windy outside. It also gets my water boiling fast, so I don’t have to spend much time waiting. Check out the video below on the BrewBuilt AfterBurner setup. Next Post What is the Best Carboy for Brewing?